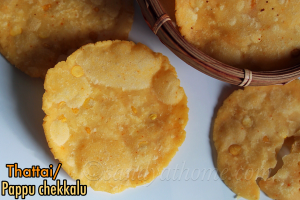 Thattai/ Pappu chekkalu/ Pappu billalu is a crunchy and yummy South Indian fried snack prepared during festivals. 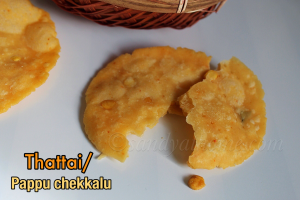 Thattai/ pappu chekkalu is prepared with 3 types of flour: rice flour, urad dal flour and gram dal flour for which I have provided the making along with pictures below. This aromatic snack can be prepared easily at home without much hassle and can be stored for a week in air tight container. 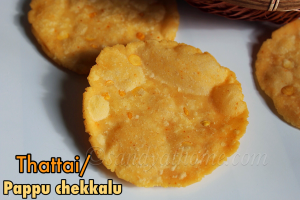 The best thattai that I have tasted till now is from “grand sweets and snacks” which is rarely found in stores here, and this recipe taste is just close to my favorite thattai recipe. 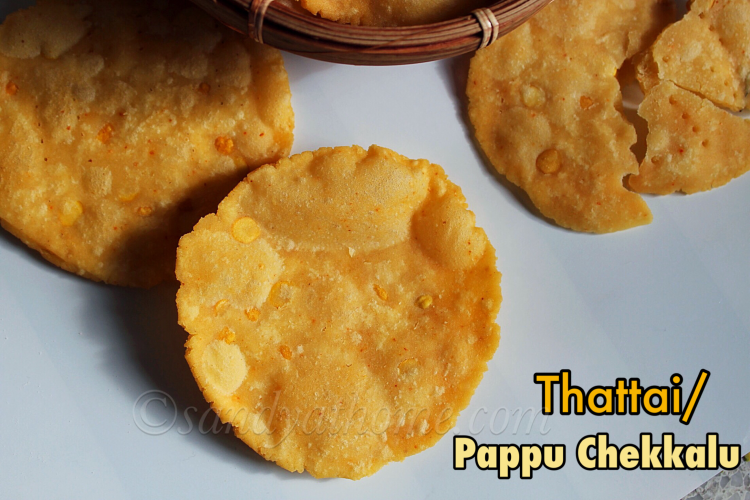 Thattai is called Pappu billalu at my house and my mom makes really tasty ones. 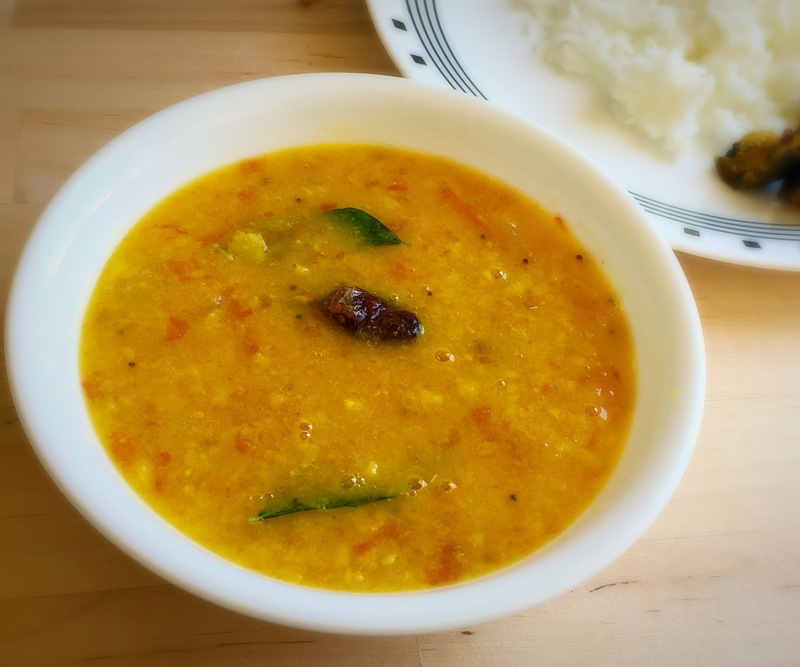 The below recipe requires grinding of 2 flour and soaking of channa dal which gives extra taste and crunchiness to the recipe. 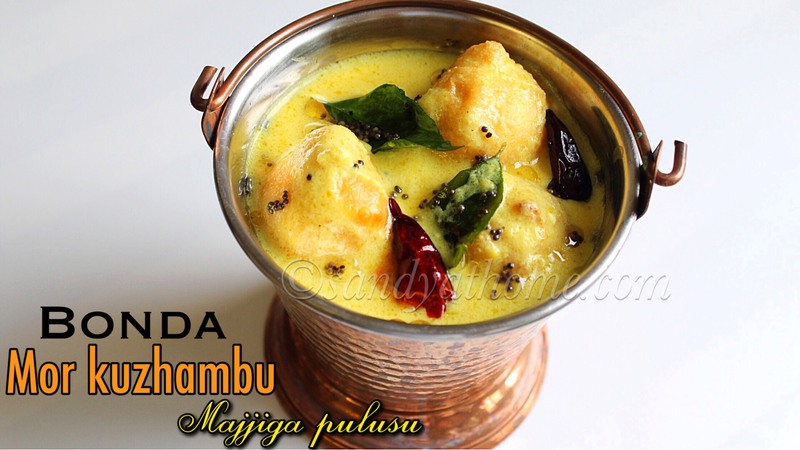 We usually prepare murukku for bhogi and i thought to prepare thattai too along with it for a change. So lets get to the making! 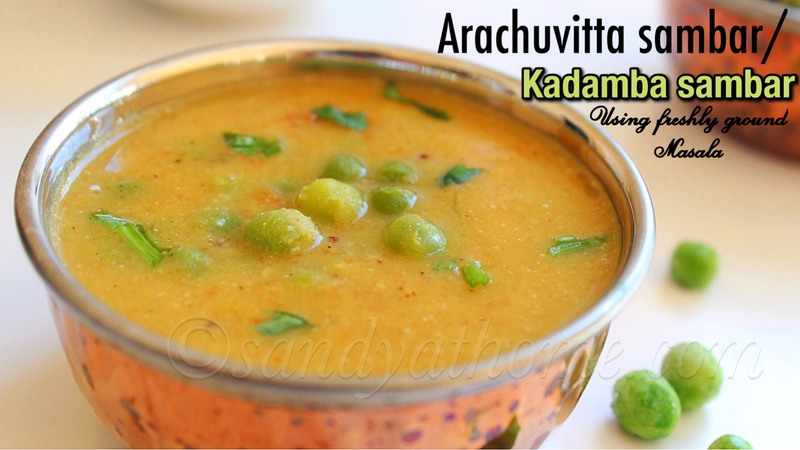 Wash and soak channa dal in a bowl of water for 20 to 25 minutes. Heat a pan, add urad dal and dry roast in medium flame until golden brown. Allow it to cool down, then add it in a blender and grind it into fine powder. 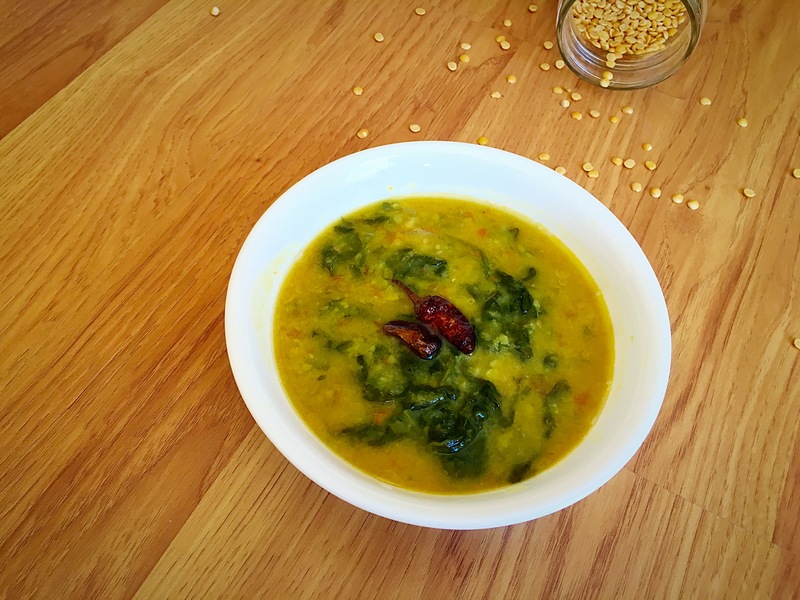 Take a wide bowl, add rice flour, urad dal flour, gram dal flour, red chilli powder, salt, curry leaves, melted butter and sesame seeds. Mix well. 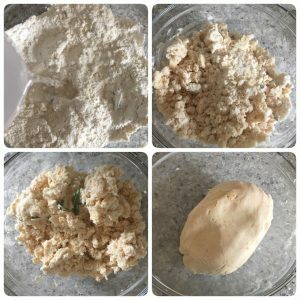 Now add water gradually to form a soft dough. Heat oil in a pan. 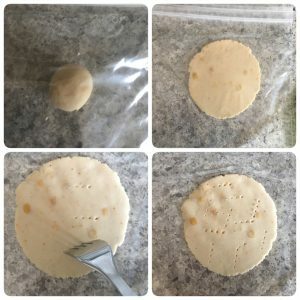 Pinch a small portion of ball place it on a ziploc cover/ any cover. Now place another cover on it and press it using a small cup/ cap to flatten it into small roundel. 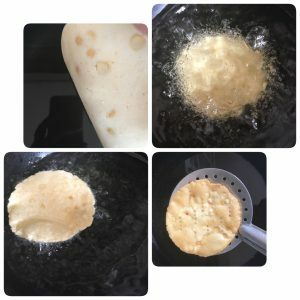 Gently take the flattened thattai/ pappu billalu from the cover and slide it into preheated oil and cook in medium flame until golden color is achieved. When done remove it using slotted spoon and transfer it to a plate with paper towel. Repeat the whole process until all the dough is complete. Serve thattai/ pappu billalu withh tea/ coffee and store the remaining in air tight container.